Written and Directed by Sam Raimi. Starring Bruce Campbell, Betsy Baker, Hal Delrich, Ellen Sandweiss and Sarah York. THE EVIL DEAD is, simply stated, a horror movie classic! This is easily one of the scariest, most gore drenched 'splatter' films of all time! Five young people go off to a cabin in the woods where they discover THE BOOK OF THE DEAD. Demonic spirits begin possessing the group one by one and all hell breaks out as they chop and slice each other up in furious action packed bloody gore. A must see for fans of ultra gore and unrelenting horror! 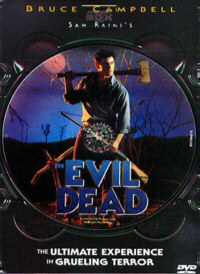 THE EVIL DEAD is currently available on DVD video in two different versions. One by ANCHOR BAY ENTERTAINMENT and the other by ELITE ENTERTAINMENT. The version from ANCHOR BAY ENTERTAINMENT has been digitally remastered and the film looks so good it is hard to believe that it was a low budget 16mm film. The sound has also been remastered in 5.1 Dolby Digital Sound and is very good. There are really no extra materials here on this release other than the original theatrical trailer. However, there is a neat packaging gimic. The DVD comes packaged in a special clear super jewel case. The reason for this is that the DVD is a picture disc, and there are 5 unique designs, one of which is the image to the left. When ordering from AMAZON.COM you CANNOT specify which of the five picture discs that you want but the content is the same and only a die-hard collector would care anyway about which cover design they might want ... some die-hard collector's have even bought all five versions! As good as the ANCHOR BAY ENTERTAINMENT release is, the ELITE ENTERTAINMENT version is even better! � Two Audio Commentary Tracks! As you can see, the ELITE ENTERTAINMENT version really lives up to being called a SPECIAL EDITION and for the die-hard fan this is definately the version to get! Please note that ANCHOR BAY ENTERTAINMENT is planninig on releasing yet another version of this movie sometime in late 2000 or early 2001. The details are minimal at this point and no firm release date has been set yet. All they have said is that it will be a THX REMASTERED edition. Yet, the current versions (especially the ELITE release) look and sound SO good I can't imagine how it could be improved!